Years later I got my wish. I am about 50 miles away from the chancery. I almost never go to the chancery office. We communicate by telephone and email. That’s enough. My remote location has an upside and a downside. The upside is that I don’t know much about what is going on in the Archdiocese of Washington. The downside is that I don’t know much about what is going in the archdiocese. Big upside. Small downside. Younger priests often think they would like to be involved with the big doings at the archdiocese. But pretty quickly we learn that the real work of the church is in the parish, not the corridors of the chancery. Our work is measured in people, not paper. In parish ministry we form a real bond of connection with people. Parish priests get to see the action of grace at work in people’s lives. I have been in this parish 17 years. I’ve seen people grow up and grow old. I’ve been present for the birth of the babies and the death of our elderly. I’ve visited them in hospitals, jails, drug treatment centers, nursing homes, halfway houses and ordinary houses. I’ve been in every funeral home and most regular homes in my parish territory. All of these actions form a bond of intimacy. This year, at confirmation, the auxiliary bishop was talking about how much he misses parish ministry. At the end of the confirmation Mass, I asked the youth how many of them I had baptized. Practically everybody raised their hand. That is a gratifying feeling to a priest. It is the closest we come to being a parent and seeing our children grow up. Most bishops were probably secretaries to bishops. They spend much of their lives in the administration of the church. It is more about rules than relationships at that level. Chancery offices revolve around canon law. They generate and enforce policy manuals. They set norms and standards and rules and regulations. All of that stuff is necessary to keep the church off the shoals of disaster. But none of chancery work teaches the central thing about parish ministry. This also has its upside and downside. The upside is that even in a celibate life, you find love. The downside is that you share in a lot of sorrows and pain. Big upside, small downside. In every career, we have a choice to make. We can decide if we want to be “in the field” or “in the office.” My doctor said he had to make the same choice. He had to decide if he wanted to teach medicine or practice medicine. He decided to practice it. Priests are the same: We have to decide if we want to focus on the life of the parish or academia or administration. I suppose the right answer depends on the person. For me, the right answer was clear almost from the start. I wanted to be with people. That is where I see the action of grace. That is where souls are saved, lives are changed and love is found. 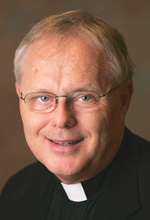 Father Daly is pastor of St. John Vianney Parish in Prince Frederick, Md.